Not to be confused with Cocaine Blues. Glyn Johns produced the Clapton recording, which was released on the 1977 album Slowhand. A live version of "Cocaine" from the album Just One Night charted on the Billboard Hot 100 as the B-side of "Tulsa Time", which was a No. 30 hit in 1980. 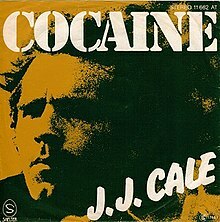 "Cocaine" was one of several of Cale's songs recorded by Clapton, including "After Midnight" and "Travelin' Light". AllMusic critic Richard Gilliam called it "among [Clapton's] most enduringly popular hits" and noted that "even for an artist like Clapton with a huge body of high-quality work, 'Cocaine' ranks among his best." ^ "Austriancharts.at – J.J. Cale – Cocaine" (in German). Ö3 Austria Top 40. Retrieved June 12, 2014. ^ "Offiziellecharts.de – J.J. Cale – Cocaine". GfK Entertainment Charts. Retrieved June 12, 2014. ^ "Charts.nz – J.J. Cale – Cocaine". Top 40 Singles. Retrieved June 12, 2014. ^ "Swedishcharts.com – J.J. Cale – Cocaine". Singles Top 100. Retrieved June 12, 2014. ^ "Swisscharts.com – J.J. Cale – Cocaine". Swiss Singles Chart. Retrieved June 12, 2014. ^ Gilliam, Richard. "Eric Clapton – Cocaine – Song Review". AllMusic. All Media Network. Retrieved June 12, 2014. ^ "Eric Clapton Rethinks Playing'Cocaine'". Fox News Channel. Associated Press. December 31, 1969. Retrieved July 9, 2010. ^ "Eric Clapton rethinks playing 'Cocaine'". Alcohol and Drugs History Society. October 5, 2006. Retrieved July 9, 2010. ^ "Top RPM Singles: Issue 0234a." RPM. Library and Archives Canada. Retrieved June 12, 2014. ^ "Tipparade-lijst van week 51, 1977". Dutch Top 40. Retrieved August 8, 2015. ^ "Eric Clapton – Artist Biography". AllMusic. All Media Network. Retrieved June 12, 2014. ^ "Canadian single certifications – Eric Clapton – Cocaine". Music Canada. ^ "Italian single certifications – Eric Clapton – Cocaine" (in Italian). Federazione Industria Musicale Italiana. Select "2017" in the "Anno" drop-down menu. Select "Cocaine" in the "Filtra" field. Select "Singoli online" under "Sezione". ^ Härtel, Alexander (1997). Platin Songs (in German). Berlin: Kupijai & Prochnow. pp. 12–17. ISBN 3-932051-46-7. This page was last edited on 14 March 2019, at 14:32 (UTC).